DVD Decrypter is a free tool which enables you decrypt and copy a DVD to your PC's hard disk. From there you can choose to watch them with the likes of PowerDVD and WinDVD or you can re-encode them to MPEG1 (VCD) or DivX. Advanced functionality can be found in the DVD Decrypter context menus. It is the best for copy dvd or cd. I use it. 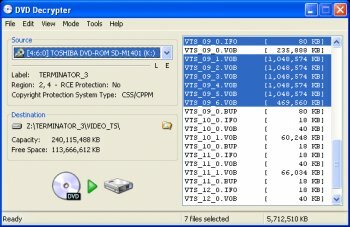 DVD Decrypter is a free tool that allows you to decrypt and copy a DVD to the hard drive of your PC. From there you can choose to see with the likes of PowerDVD and WinDVD or you can re-encode them to MPEG1 (VCD) or DivX. Advanced functionality can be found in the DVD Decrypter context menus. I like this DVD player very much,have downloaded it,for its convenient electronic devices,will tell my friends.